Most successful new generation combined trapezoidal and re-entrant 60mm profile. Versatile. Combined round shouldered profile gives excellent span capability with straightforward service attachment. Low concrete and steel usage. Available in Colorcoat FD® pre-finished steel to the soffit. 600mm cover, as recommended by Health and Safety guidelines. Virtually flat soffit for a clean aesthetic appeal. Composite performance – floor slab. New embossments give even better shear key. Composite performance – beam. Due to effective shear stud performance. Composite Profiles helped transform Reading’s business landscape with the development of Forbury Place, Reading’s newest high-profile business district, conveniently located walking distance from the redeveloped Railway Station (another Composite Profiles project). 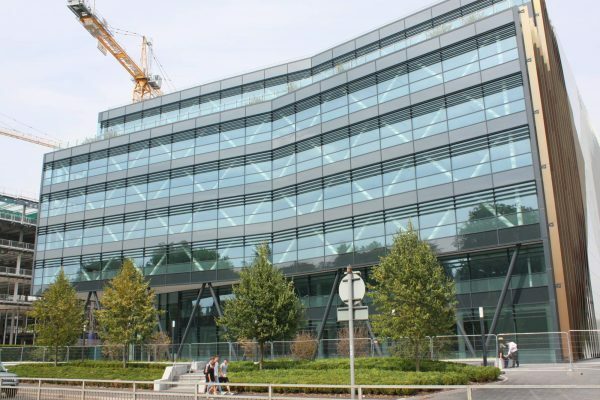 Forbury Place has quickly established itself as a strategically vital hub for business featuring the largest floorplates in town, Grade A specification, car parking and exceptional transport connections. Composite Profiles is proud to have provided a complete metal decking solution with 50,100m2 of Tata Steel’s composite floor decking forming Buildings 1 and 2 of this high profile business development. Ribbon-like vertical fins around the exterior of the building provide solar shading and subtly create an illusion of movement as you walk past. The aesthetic of the building is further enhanced by its ‘diagrid’, a powerful diagonal form that provides unique visual branding. Inside, the stunning double-height reception creates an expansive vista. To develop a comprehensive composite deck package, which would provide quality design, excellent programme timescales and great value for money. Working closely with the Galliford Try Construction team, we successfully supplied and installed more than 50,100m2 of ComFlor® 60 and ComFlor® 51+ over eight floors and podium slab for Buildings 1 and 2. The safety netting, more than 170,000 thru-deck welded shear studs and more than 6,500m of edge shutter were expertly managed and installed, resulted in us receiving Galliford Try Construction’s Site Safety Award. The architectural features created challenges at times, although our highly skilled installation team managed to maintain programme and budget by working closely with Galliford Try Construction. Our vision of Building Excellence through Teams, Relationships and Knowledge dovetailed with Galliford Try Construction’s overall mission, which resulted in a really productive working relationship and ultimately us receiving their award for Site Safety Management.